Oh yeah! Check it out it’s the second installment of my Weekly Comics series! This time I’ve got an awesome comic that’s been stewing in my head for nearly a year now, its first iteration done on a piece of receipt paper at my horrible restaurant job. It’s great to finally get it out there for world to see. This comic took forever to thumbnail. I could not figure out what I wanted to do for my first panel. Initially I had imagined a squire stumbling upon a bunch of knights getting torn to pieces by this dragon here, but I just couldn’t make it work. 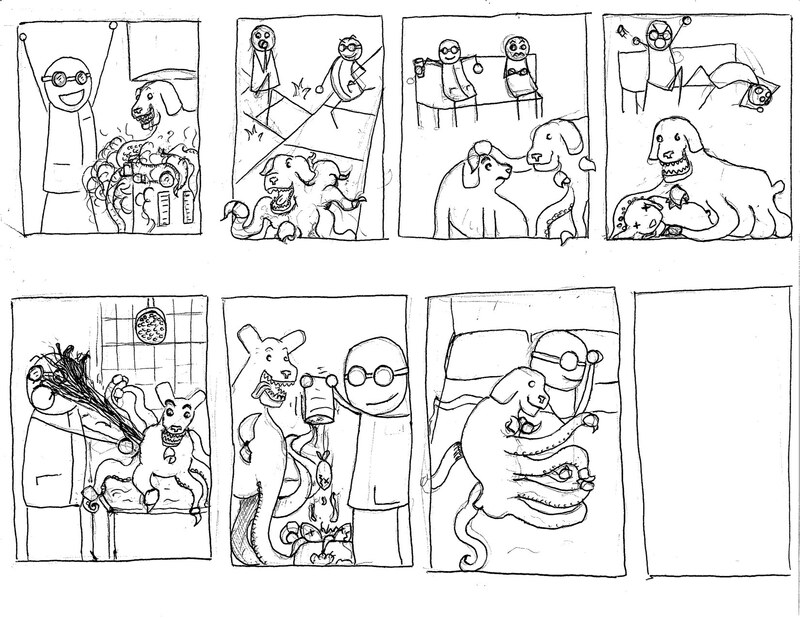 Again, I probably redrew the thumbnails 6 times or so, and that first panel at least a dozen times. Finally I just broke down and drew something to set the scene, a dragon flambéing some knights. I really like how the first panel turned out, and I think I drew the dragon pretty darn consistently up until the very last panel. I love the expression of my timid knight in the third panel and the way the dragon looks in the fourth and fifth panels. I also like how the speech bubble breaks the panel borders at the end. Overall I think I did a fine job with the pacing and created something that’s both readable and kinda funny. To me at least. Heh. 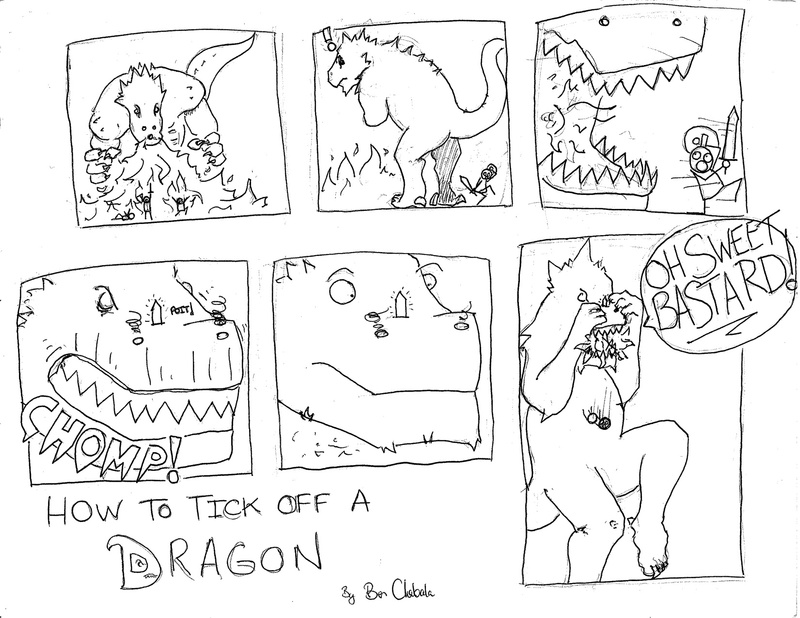 The last panel with the dragon… Gah I wish i drew that differently. I wish I had either gotten rid of the flames or showed more of his face or something! It just looks weird as is. Also I wish I had utilized the space on the page more… efficiently. I would have made the panels bigger and maybe moved the title somewhere else. I would aslo have made the title cooler, maybe using fancy medieval style lettering. Lastly, I probably would have made the dragon more dragon-y. Maybe giving it wings or making it look less like a dinosaur. I dunno. Honestly I think this is much much better than my first comic. I utilize the majority of the space on the page and the story has a clear beginning, middle, and end. I think. I draw things a bit more consistently, and… yeah, I think it’s pretty ok. I tstill need to improve my materials I think, and not use a ballpoint pen for inking. Let me know what you think! What do I need to work on? Help me help myself team! Editorial Edits – Aquawoman? You’re afraid of Aquawoman? Welcome to the triumphant return of Editorial Edits! It’s been a while but I really wanted to get back into this seeing as I’m doing so much research on comics editorial. Thought I’d try my hand at doing some of my own. Every week I’ll be combing through my new comics pile and finding something that I can comment on while wearing my fancy editorial hat. In this particular instance it’s not solely a matter of page construction, the story/dialogue makes this slip up an issue. Mera went to the local general store to pick up some dog food for the canine Arthur recently adopted. She is physically harassed by the manager of the store and finally, after asking him not to touch her, she breaks his arm. This page shows the police rolling up after the water witch dispatches the in-house security. Doesn’t seem to make much sense does it? I think the solution to this particular situation might be as simple as moving the thought bubbles a little to the left. This would make it look like Randy was yelling “Aquawoman!” and the police would look as though they were making fun of him, which is most likely how it was supposed to be. Can you spot another small tiny, itsy bitsy “mistake” on this page? It’s in the very last panel. Did you find it? Mera uses a double negative, “It’s not a wound he won’t recover from.” As an editor I think I might have asked Geoff why he had her using a double negative before ok’ing it, maybe have her say something like “He will heal,” but dialogue is tricky. You have to take into account the voice and speech patterns of the character. 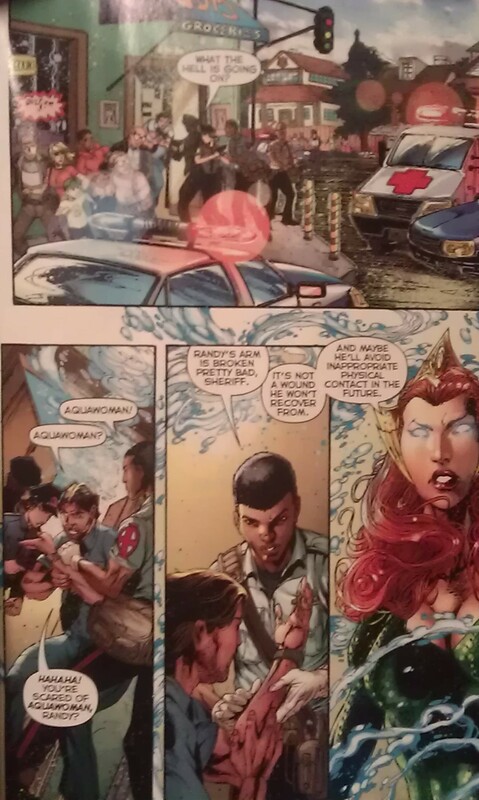 Does the double negative fit the way Mera speaks? Is it true to her character? In this case I think so, and it works. As an editor, I think it’s inevitable that some things are just going to slip through the cracks. That’s not on anyone, especially the people working so hard on the book. You’re just too close to the material. You’ve seen these pages dozens of times and… Well you know. I want to emphasize that Editorial Edits isn’t meant to call out any editor or creator or anything like that. This is meant to simply be an exercise in which I talk about the decisions that editors make while working on comics. The inherent problem with this is that I will almost always be highlighting mistakes or little slip ups, because when editors do their jobs perfectly, we praise the creators for their vision and talent, not the editors for putting it all together. I’ve heard editing is a thankless job, and that when things go wrong editors get blamed. I’m ok with that, and I hope Sean and Pat don’t mind me pointing out these little mistakes. Heck, they’re probably well aware of them, but the book’s printed, that ship has sailed. It’s time to move on, and so I’ll leave it at that. Great comic this week, keep up the good work gentlemen! Weekly Comics – Birth of the Cephalopoodle! So part of my independent study for this semester is focusing on creating my own comics and examining my specific editorial processes. This week I’m very pleased to unveil Birth of the Cephalopoodle! I got the idea for this a while ago while my girlfriend and I were watching a Discovery Channel program about cephalopods. And who doesn’t like drawing tentacles? Right now, seeing as this is one of the first comics that I’ve actually committed to paper, I really had no idea what I was doing. I did this with pencil, on a piece of used computer paper, and inked it with a ballpoint pen… Comic making on a grad school budget! I don’t really like drawing people, wait scratch that, I’m horrible at drawing people, that’s why I stuck with a stick figure mad scientist here. I just did some quick sketches laying out the panels and stuff. I tend to get a little to detailed while I’m working on the thumbnails, but in this case I was just really excited to draw an octopus dog. After I’ve got a rough idea of how the panels will look and things are starting to take shape I’ll pass the page off to a few people wherever I’m at and make sure that it makes sense. If it does, great, if it doesn’t I ask for some feedback about what’s not clear. Who are my editors? Random people! Then I just get to work drawing. I really loved the idea of a half octopus half dog. Initially I had wanted the scientist to take his cuddly monstrosity to a dog show, have it lose, and unleash it on the other dogs. Either that or have it compete in a mad scientist “creature off.” I love having the beak in the middle of its chest. The expressions on the mad scientist were a blast and the dog itself was both frustrating and fun trying to think of where to put all his tentacles. Gosh where do I start? I wish I had used different materials. The ballpoint pen would randomly squirt out extra ink so keeping a consistently fine line was a chore. I learned that I’m HORRIBLE at perspective. I think the second panel would look much nicer without so much sidewalk between the scientist and the cephalopoodle, but I couldn’t figure out a way to make it look right. Also in that same panel I might have had him going to the right instead of the left, to lead your eye to the next panel. I wish I had used a ruler so everything wasn’t so haphazard looking and I wish I had given this a title somewhere. Also, I can’t believe I didn’t fill that last panel but I misread my thumbnails and realized too late that I didn’t actually have an eighth, so I just stopped. Lazy. I wish that I had done the fifth panel from a higher perspective, so it actually looks like he’s trying to force the dog into the bath, and I would have reworked the dogs expression. He looks happy instead of terrified. I really enjoyed drawing this little comic, but I feel like it’s lacking in some very serious ways. It’s really sloppy, my craft is horrendous, and I should have allocated more action to the middle of some panels. I need to work on my perspective, it should have been longer, at least eight panels, and… I don’t know. I’m pleased with the idea behind this strip, but it needs a lot of work. I’d love to hear what you guys think about the strip though. What needs work? What do you like? What would you have done differently? Let me know! I’ve been talking to some great creators about their editorial practices and I’m noticing some common threads throughout. Everyone has seemed to note that editors do the typical editing stuff. They do the spell check, they make sure the art and characterization are consistent, all of that jazz. I don’t want to talk about everything here but one of the main things that I’m interested in, “Who does the editing when their isn’t an ‘official’ editor on the project?” Answers ranged from personal editorial (which I think all creators, writers, artists do on some level) to wrangling in moms, fiancees, friends, and dedicated readers. Right now it seems like almost anyone can fill the role of editor in some capacity. I’m also very interested in what people think of editors. Are they necessary? Do they help? How might they help? I may also have to rewrite some of my questions to reflect this… Crud. Anyway, I’m loving the feedback I’m getting here and everyone has been really helpful with their input. I’m learning more about comics editorial every day! Just when you thought you had heard the end of Norman Osborn… I mean this guy declared war on Asgard! This guy is back for more madness, plaguing the Avengers and starting shenanigans at every freaking turn. He’s such a jerk. Anyway, these 5 comics spotlight some of the most horrendous deeds in ol’ Normy’s life. Dig in! The Changing Face of Comics Editorial – What Does an Editor do? Before I start asking my fancy comic book friends about about what they think an editor is, maybe I should try to tease out what I think an editor is and does? I think this will provide a sort of baseline for the insight I gain through my my interviews. Alright, so most importantly the editor is the King of Clarity, or the Queen of Clarity if you so choose. Their chief job is to make sure that a comic is readable, cover to cover. Are the panels clear? Do the word balloons say what they need to say? Is everything drawn consistently? OK, so if I wanted to break that down I could say: Panel Composition, Artistic Consistency… And I’m totally forgetting the written element, the narrative. Does the story make sense? Do the things that people say sounds like the things people say? Then I suppose it comes down to brass tacks. Spelling, punctuation, standard editorial madness. But then I think there’s a whole ‘nother level to editorial that I’ve never even glimpsed, sort of the managerial, project management style duties. I feel as though this sort of thing only really happens when a book is making a bit of money and publishers want to make sure everything runs smoothly. Ok, so as we can see through my rambling that I have a murky idea of who an editor is and what he or she does. They’re the Kings and Queens of Clarity, they’re project managers, text editors, and art critics. Now I just need to start talking to creators!